The stage constitutes a very important chapter in the social and political history of a people and the bend of the national genius can't be full comprehended without its study. A puritan may look askance at the play-house, but its influence over the mass can't be ignored is known by its theatre.' One can know more about Greek character from their immortal plays than from the pages of a formal history. Likewise the Mricchakatika or the 'Toy-cart' gives us a more graphic picture of the ancient Indian society than any other treatise of that time. From the pure standpoint of art, dramas and the stage have an ethical and historical value of their own. Bengali drama, like Bengali language, has its origin in the remote past, but like many other modern institution of the country, is an adoption after the western ideal, and the modern Bengali stage was, in fact, first founded in imitation of the early English theatre of Kolkata. Still the spirit of Bengali drama is essentially eastern, and some of the present techniques of the Bengali stage can't be fully understood without a study of Sanskrit drama and the ancient Indian stage. No civilised country has ever been without its drama the dramatic instinct is universal. The theatre, in whatever from, sacred or secular, has never failed to make its powerful appeal to man. Every nation and every race possesses its own dramatic history, India as well as the rest of the world. The word 'drama' means action and its appeal may perhaps be explained by that wise saying in the Bhagavat Gita that phenomenon as universal as the drama, and of such great influence as it exercises, must be of importance. Classical works have been written concerning the Indian drama by Sylvain Levi, Sylvain Levi, Sten Know and Berriedale Keith, which are know to all students of the subject. Schuyler has added an extensive bibliography of the Sanskrit Drama. The study of the Indian stage has, indeed, not been neglected by scholars. What, however, has been written to date by professional Orientalists concerning the Indian theatre is chiefly on lines of acadmical scholarship. Historical studies by philologist tend to deal with the problem on the basis of theoretical canons and to follow the scholastic text books. "It is to the actor and to no one else that the theater belongs. This does not mean, of course, the professional actor alone, but the actor as poet, as director, stage-manager, musician, scene-designer, and painter and certainly not least of all, the actor as spectator, for the contribution of the spectators is almost as important as that of the cast. The audience must take its part in the play if we are ever to see arise a true art of the theatre- the oldest, most powerful, and most immediate of the arts combining the many in one." Bearing these two statements in mind it is evident that only a few years ago studies of the Indian drama based on this broader outlook were entirely lacking. Whether already at the present moment such studies can be produced with any degree of completeness may be dought. Anyhow, beginnings may be made, and should be made, aiming at a treatment of definitely limited aspects of the great subject. The confluence between European and Indian civilisation is like that of those great Indian rivers which, after uniting, flow on as a single stream, constituted by the waters of the two original rivers. So also the confluence, brought about by European colonisation, of the characteristic Indian dramatic tradition with the imported Western one has united two very different streams of theory and practice. Whether this intermixture will result in the birth of an entirely new tradition, or lead to the rejuvenation and transformation of the indigenous tradition, or to a permanent hybridization of either or both, or to the extinction of one of the two traditions in India, cannot at present be foreseen. We are with regard to the drama in a transition stage of which we cannot predict the future, as we are in a transition stage with regard to so many other cultural manifestations. All the more reason to devote to what actually exists around us with a view to its correct description, and all the more necessity to put on record whatever living detail can still be rescued from oblivion in these rapidly shifting times. And above all, all the more necessity to place on record all such details as illustrate the human, fleeting, ephemeral aspects of theatrical life, as may be reliably ascertained for as long a distance in the immediate past as lies within our reach. Such a record, if carefully made, will contain much material of the highest importance for the future historian of and theorizer concerning dramatic art in India, and though it may not be possible to arrive immediately at definite theoretical conclusions through such a record, yet such record cannot but bring together materials from which a future scholar may perphaps be able to distil laws or principles of lasting validity. As said, a few years ago studies based on the above lines were nearly entirely lacking. To-day the position is different. No less than four different scholars, of whom three are Bengalis, have undertaken an enquiry as indicated. One of them is Mr. Hemendra Nath Das Gupta, the first volume of whose work we here introduce, whilst the other three have published their results before him. The first of these is Dr.P.Guha-Thakurta who, in 1930, published in London his work entitled "The Bengali Drama, its origin and development" This was substantially the author's thesis for the Ph.D Degree of the London University for original research, 1926. The second is Mr. R.k. Yagnik, who published his work "The Indian Theatre-its origin and its later development under European influence" in London, in 1933.In so far as the modern Indian drama is concered, Mr. Yagnik mainly deals with its development in Western India. These two works are written in English. The third is Mr. Brajendra Nath Bandopadhyaya(B. N. Banerji), who published his Bangiya Natyasalar Itihas in 1933 through the Calcutta Bangiya Sahitya Parishad. It is written in Bengali and deals with the period from 1795-1876. Its contents more or less coincide with those of the projected second volume of Mr. Das Gupta. And so we come to the present book. A comparison between it and the three other works is not called for, but one may easily appreciate the motives which made Mr. Gupta decide not to abandon his work beacause recently the result of similar studies by other scholars had been published before his own. Mr. Das Gupta, himself an ardent admirer of the dramatic art, has several years ago published in his mother- tongue a critical study of the great Bengali playwright Girish Chandra. Becoming more and more absorbed in his subject he collected incidentally a number of curious and interesting data concerning the Bengali theatre, and he soon conceived the idea of writing a complete history of the Bengali stage from the realist recoverable times down to our present day. As early as 1918 he devoted his spare time in hunting through the old daily and weekly papers in the Imperial Library, where I happened to meet him frequently during my tenure of the Librarianship. Gradually he widened the circle of his researches and as a result produced a series of articles on the Bengali stage, especially in the "Forward", then edited by the late Deshbandhu C. R. Das, who himself was not only keenly interested in the subject, but encouraged the writer in every way, even to the extent of promising him to publish at his own expense the projected history, when completed, in book- form. Mr. C. R. Das died, and his patronage will not now benefit the work, but the author is too keenly in love with his subject to abandon his project and he now publishes the first volume of his history. It begins with a short introduction concerning the old Indian drama and then brings us, half-way the volume, to modern times, taking up the story of the drama in Calcutta from the middle of the 18th century. He then proceeds with the story of the various old theatres existing in Calcutta, and brings it down to the middle of the 19th century. This closes the first volume of the projected series of four. 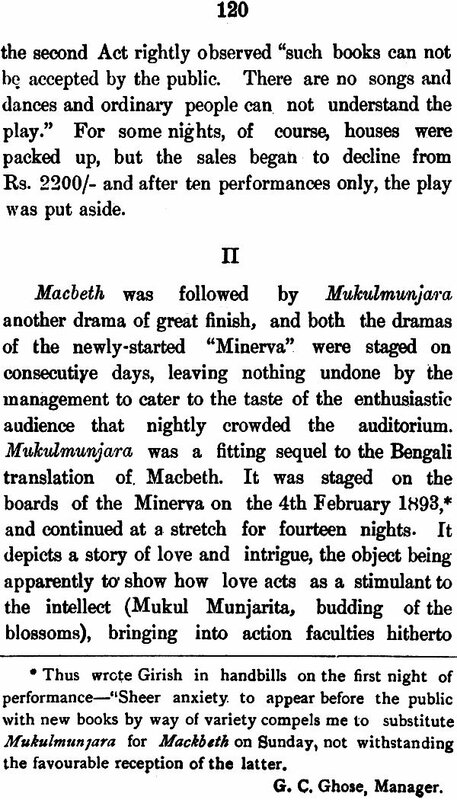 The second volume will deal with the Bengali theatres in the days before Girish Chandra up to the Dramatic Performances Act of 1877. The third volume is to be entirely devoted to Girish Chandra and his works, whilst the fourth and last volume will bring the story to date describing the development of the Bengali theatre after Girish Chandra down to our own days. The author will forgive me a personal reference in this short preface to his first volume. He is an example of that large professional class who has contributed so much to literature and scholarship in Bengal. A lawyer by profession through force of material necessity-day in and day out, busily engaged in the grim drama, or ludicrous comedy of the Courts-he sheds, as so many of his brethren, his legal robe'S when leaving court to become a student of life instead of one of law, and an incarnation of humanity instead of one of officialdom. It has always struck me how great a service the lawyer class has rendered to scholarship and literature in this country, a tradition which we would hope will not die for many a long day to come. As Secretary of the Asiatic Society of Bengal I cannot forget that this venerable Society itself was founded by a lawyer, Sir William Jones, and I most heartily welcome this latest follower of the old example. May the Author be rewarded for his labour by adequate response from his public and the apprecia- tion he deserves, and may it be given to him to bring to a successful conclusion his great project, which is to furnish the future student with a storehouse of references concerning the drama in Bengal during the last two centuries, with a great variety of living. pen-pictures concerning actors and public, and vivid descriptions of the scenes and circumstances of the Indian theatre in Bengal. It would be out of place to say anything in praise of the book in this Preface. If praise there be it should come from the reader. Any other would, according to circumstances, be either superfluous or out of place. "No skill in acting can I deem complete, Till from the wise the actor gains applause." But what surely deserves mention is a reference to the laborious nature of research entailed by the writing of a book like the present. We well know the Author's great patience and perseverance. These two qualities coupled with accuracy and enthusiasm are sure to produce valuable results. "Enough of this tedious work which fritters away . the interest of the audience! " Be ever honoured by the great and wise! I have now only to request the audience that they will listen to this work with attention and kindness, in consideration of its subject and respect for the author." Dr. J ohan Van Manen, the great Oriental Scholar of international reputation, wrote a masterly preface to the first volume of this book worthy of his erudition and culture. For the other volumes, my readers' appreciation and sympathy will form the best "Fore-word." The first volume of 'The Indian Stage' deals with Natyasastra, Sanskrit Dramas, Yatras and the English Theatres of Eighteenth and early Nineteenth Century (specially the Chowringhee and Sansouci Theatres) which contributed to the rise and development of the Bengali Stage. The present volume deals with earliest Bengali Dramas and brings us to the rise of Girish Chandra Ghose and the oassing of the Dramatic Performances Act in 1876. Since this volume was first published, I have lost a number of helpful friends whose deaths have dealt a severe blow to me. Besides the erudite scholar Mr. Sachchid- ananda Bhattacherjee to whom I owe much for my literary activities and Mr. .Devendranath Bose who gave the first inspiration. I feel keenly the absence of Mr. Kshetra Mohon Mitra, a distinguished .actor whose constant company served me as the best association for the Stage and my esteemed friend Mr. Makhanlal Sen (Author of Ramayana) who used to assist me in the arduous work. Amongst others, I feel also the loss of Natya Charyas Amritalal Bose, Aparesh Mukherjee, Surendra Nath Ghose (Dani Babu) and last though not least Chunilal Dev. Amongst the living persons, many have helped me and I express my heartiest grateful- ness to those friends and wellwishers. Stage, at one time in Bengal, was a very useful institution for mass-education and for inspiring the people with noble and lofty ideals, though it now seems to have lost its former glory. Records of the achievements of the great pioneers in this who had devoted their lives for the furtherance of its cause constitute a vital chapter in our national history. That the subject is of general interest is evidenced by the fact that the famous Standard Literature Co., has undertaken to push the sale of the History of the Indian Stage. For the publication and compilation of these volumes however, if I am to express my sincere, grateful thanks to any person, it is to Mr. Sachchida- nanda Bhattacharjee, one of the famous business- magnets of the present time. Most people know Mr. Bhattacherjee only as a business-man, but those who had the privilege of coming in close touch with him know what a rich and philanthropic heart he possesses. Endowed with a keen philosophical bent of mind and an acutely logical intellect, he is devoting his valuable. time in devising means and measures from Shastrae for uplifting the economic and moral condition not only of his countrymen, but also of the whole world. But for the invaluable help of this remarkable man, none of my books since 1933 would have seen the light of the day. May he live long to the delight and great benefit of his countrymen! Next, I am duty-bound to express my grateful. ness to some gentlemen of position for their encouragement and ungrudging help. Of them, I should first mention the name of the famous journa- list Mr. W. C. Wordsworth, late Director, Public Instruction, Bengal, who took the trouble of procuring for me some old files of the Statesman from its Delhi office. Such goodness and courtesy are quite rare. I ought to thank Mr. R. G. Stephen, Managing Director, and Mr. A. N. Banerjee, Manager of the Standard Literature Co. for urging me to proceed with my work, Next my thanks are due to Mr. Nalini Ranjan Sarkar, a worthy son of India who always takes a lively interest in my literary works. For the "Marathi Theatre", I am deeply indebted to Mr. V. B. Chitale, who has taken great pains to collect all facts for me especially from Marathi Natyakala and Natya Wangmoy. My thanks also are due to Dr. S. P. Agarkar, M.A., ph. D., for the interest he has taken in this history. My research work has been pursued mostly at the Imperial Library since 1918, when Dr. Van Manen, who has kindly written a masterly introduc- tion to my first volume, was the librarian 'and I am thankful for the interest that the library authorities always take in my works. But for the co-operation, help and assistance given to me by my esteemed colleagues Messrs. A. B. Chatterjee, M.A., 'F.R.E.S., and S. N. Sen, B.COM., this book could hardly be published. I am grateful to the authorities and staff of the Metropolitan Printing & Publishing House, Ltd., especially to Mr. K. V. Appa Row, B.A., B.L., who is also helping me for the Madrasi Theatre. The history of the Indian Stage is now complete for the present. Ten years ago, the great orientalist Dr. Johan Van Manen who honoured the writer with a masterly introduction to the first Volume, gave in it a synopsis of the contents of the succeeding ones, and I thank my stars that I have been able to bring out a connected history from the pre-historic period down to the present day, How far I have been suc- cessful in my endeavour, it is for my readers to judge. I can not however bid ferewell to my readers without expressing my deep gratitude to the famous business-magnate Mr. Sachchidanda Bhattacharya whom I have the proud and unique privilege of claim- ing a former student of mine,-now a famous perso- nality, equally distinguished for the great qualities of both head and heart, without whose kind help, the History-nay more, no other literary work of mine would have seen the light of the day. I shall also express my thanks to the various per- sons who have rendered me help in various matters for the present work, notably amongst them to my late lamented friends Babus Kshetro Mohon Mitra, Chunilal Deb, Abinash Chandra Gangulee, Natya- charya Amrita Lal Bose, Aparesh Chandra Mukherjee, Jogesh Chandra Chowdhury and to the living drama- tists Babus Manmatha Nath Roy M. A., B. L. and Mohendra Nath Gupta M. A., as also to my esteemed friends Asoka Nath Bhattacharya Vedantatirtha M. A. Rabindrs Nath Roy, Sa too Sen, Kiron Chandra Dutt, Akshoy Kali Koer and NikhilendraKrishna Deb. I must acknowledge with gratitude that I have been greatly assisted and treated with great consi- deration in my consistent research work by the Librarian and the whole staff of the Imperial Library. My thanks also are due to my friends Messrs B. N. Das (late M. H. R. Burmah), P. C. Thomas of St Paul School, J. C. Guha (Professor), Upendra Chandra. Das Gupta. (Advocate), Kali Das Roy (Poet), Raghunath Dutt of Bholanath Dham, and last and not the least to Mr. Makhanlal Sen, the translator of Ramayana in English and author of Lord Srikrishna, for his literary help. The suggestion and encouragement I received from Srijut Devendranath Bose has already been acknowledged. Lastly I am very grateful to Mr. Sudhansu Ranjan Sen Gupta Advocate and Proprietor Truth Press who has not only taken personal interest in my work but also for the interest he and the whole staff of the Press have taken in expediting my work and bringing it out successfully. I am particularly thankful to my friends Mr. A.B. Chatterjee M. A. and Mr. S. N. Sen, B. Com. for the keen interest they took in my work. The task of bringing out works like the History of the Indian Stage, Bankim Chandra, Girish Chandra, Deshbandhu Chittaranjan is quite Herculean and I think it should receive due recognition from the Uni- versity and it should see that the writer may be in a position to continue arduous researches unhamper- ed ; though I should admit that it has encouraged me by honouring me as the first Girish Lecturer of the Calcutta University and prescribing "The Indian Stage as a text book for B.A. classes (Sanskritic) for which I heartily acknowledge my grateful thanks to that angust body. Chapter I. The Early Bengali Plays. Sakuntala at Chhatu Babu's House, Kali Prasanna Sinha's Vidyotsahinee Theatre Veni Sanhar, Vikramorioshi, Sabitri Satyaban. 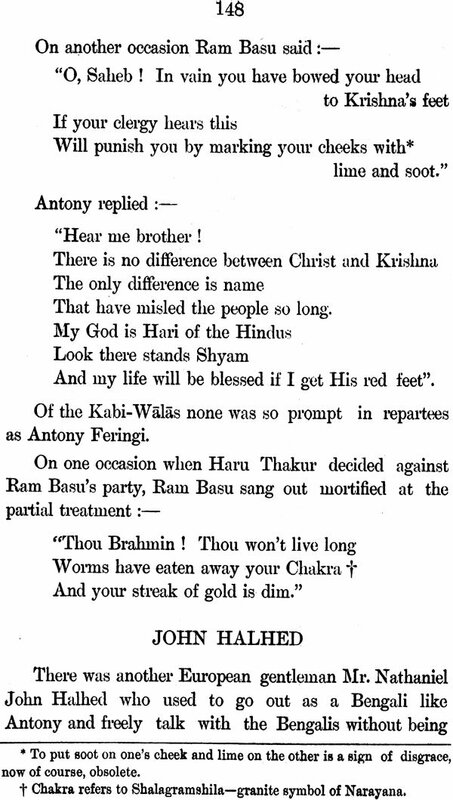 Ratnavali, (1858) Sarmistha, (1859) Rev. Keshav on the Stage, Vidhavavivaha Natak (1859). Chapter V. Three Aristocratic Theatres. Padmabati 1867, Kichhu Kichhu bujhi 1867 Kabi-contests in Theatre. 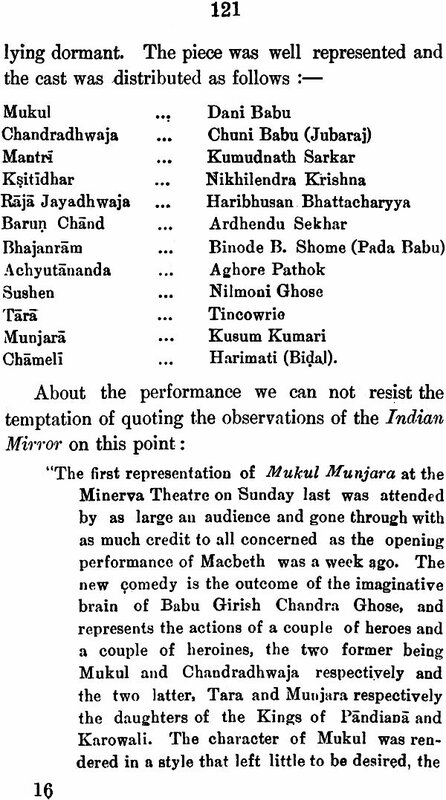 Dinobandhu's Sadhabar Ekadashi and Girish's Nimchand, Lillabati (1871) Public Theatre Nildarpan (Dec 7, 1872) National and Hindu National at Dacca. Chapter X. Great National Theatre. Bhubon Neogi, Kamya Kanon 31st Dec 1873, Mrinalini, Sati Ki Kalankini and Female actresses, 19th Sept, 1874. Gloom after Dramatic Performance Act. 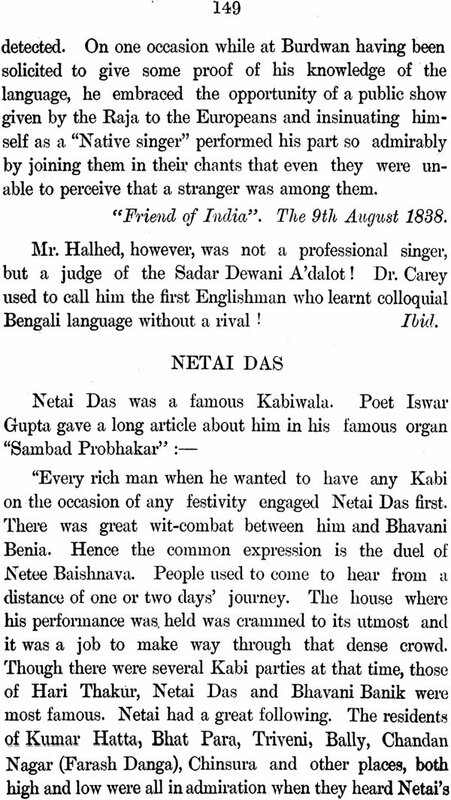 Girish starts National Theater with Kedar Choudhury - Megnadbadh performance, Battle of Plassey, Beesh Briksha, Durgesh Nandini, N. T. at Dacca, Protap Jahuri purchased N. T. Hamir (1881) Mayataru, Mohini Protima, Madhabi Rabonbadh, Sitar Banobash, Abhimonyubadh, Pandober Ajnatabash. Gurumukh Ray proprietor - Dakshajanjna, Dhruba, Nala Damayanti, Middle-class-men proprietors - Chaitanya Lila Col. Olcott, Ramkrishna Dev, Bibaha Bibhrat, Lord dufferin, Buddha, Bilwamangal, Theatre-house sold to Gopal Seal, Star at Dacca, National Theater performs Anandamath-Girish at Emerald, Purna Chandra & Bishad. Girish starts with Nagen Mukerjee as lessee, Macbeth, Mukulmunjara, Abu Hossien, Jana, Karametibai, Profulla, Girish leaves Minerva and joins Star. Chandrasekhar, Kalapahar, Mayabashan Religious Unity and India's only solution. Beena Theatre, Emerald Theatre Mustafi leaves Minerva for Emerald. Ardhendu, Nilmadhab Chakraborty, Bengal theatre, City at Emerald. Parijat Monjari of Madana, Ramchandra, Premanonda, Akhyans, Bhabais, Ranchhod Bhai, first social tragedy Parsees' attempts, Garabi, Dholsaji, Nanalal, K. M. Munshi, Chandravadan Mehta, author's ideals of National Stage, Girish Parishad. Harikatha, Lalit, Tamasha and Ramjoshi Sangli stage 1843 Vishnudas Bhabe, Kirloskar, Sakuntala, Trilokekar, Kalhatkar, Dewal, Khare, Balgandarva, Kelkar, Films. Classic Theatre - Hariraj, Alibaba, Girish at Classic -Pandava Gourava, Mohendra Bose, Tincowri. Recapitulation of matters of all volumes and story of reconstruction by Chuni Babu. Mr. Upendra Mitra's regime and after. Nritya Gopal, Gispati Kabyatirtha Jarjara festivals by Asoka Sastri, &c.
At Jorasanko, Santi Niketan and Empire Theatre. Sangit Samaj, University Institute East Bengal Club and Alipur Dramatic Club. including other districts of Bengal Dacca, Vikrampur, Mymensing, Labpur, Kalia. Mr. Sisir Bhaduri including his American tour.